Strawberries are in season, and in abundance! They’re tempting in pies, jams, shortcakes, cookies, muffins and scores of other sweets. But perhaps this season, you’ll try them as part of a savory dish. 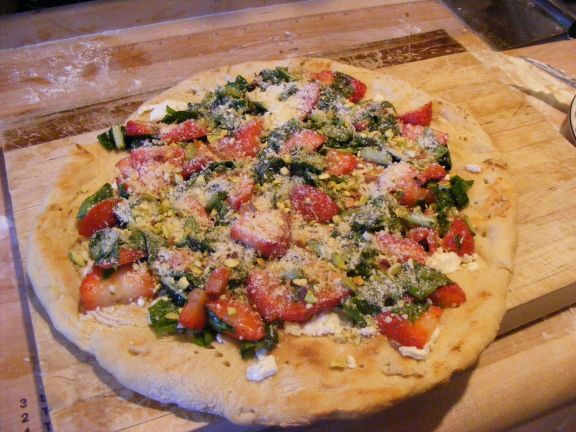 Paired with soft cheese and fresh greens top a hot, crispy pizza crust, strawberries find a new home as dinner, not dessert. It’s a light and lovely meal for a summer’s evening. Preheat oven to 425-degrees. Place crust on a baking sheet and bake for 8 minutes or until hot. Remove crust from oven and arrange goat cheese evenly over crust. Combine strawberries, watercress, olive oil, juice, salt, and black pepper; toss gently to coat. Arrange strawberry mixture evenly over goat cheese. Sprinkle pizza with Parmigiano-Reggiano and nuts. Cut into wedges and serve immediately.